While walking around Edirne, I was surprised by the number of old, stone bridges (köprü) – at least nine – that we crossed. Some of the city’s bridges even were designed by the famed Ottoman architect Mimar Sinan. (The Süleymaniye Camii in Istanbul is one of his famous works too.) However, we crossed over Sinan’s bridges during our morning run sans camera. In his lifetime, Sinan reportedly designed and built 81 mosques, 51 bridges, 35 hamam, 18 caravanserais, many aqueducts, hospitals and more. Amazing! On Saturday afternoon, we walked in a southerly direction from our hotel and first crossed the Tunca (Ekmekcizade Ahmet Paşa) Köprüsü which is over the Tunca Nehri (River). The bridge, built between 1608-1613, was designed by architect Mimar Mehmet Ağa, who may have been one of Sinan’s students. About 10 minutes later, we walked across the Meriç Köprüsü, which is one of the city’s “newer” bridges, with construction started in 1842 and completed in 1847. It measures 263 meters, 7 meters wide (barely enough room for 2 cars) and has 12 lancet stone arches. On the other side of this bridge are several restaurants. We decided to enjoy a cold pint of Efes beer while we watched another Turkish sunset along the Meriç Nehri. The Emirgan Aile Çay Bahçesi, located on Karaağaç Yolu, was the perfect place to do just that. If you don’t feel like walking back into town, there are several horse-drawn carriages. Of course, when we were ready to leave, none were available. 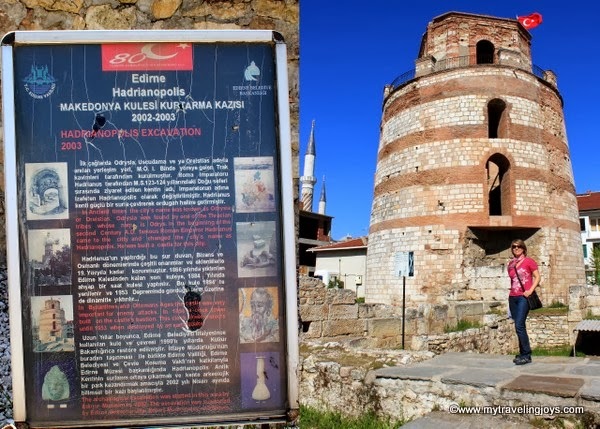 Another sight to explore while in Edirne is the Makedonya (Saat) Kulesi ve Kentsel Arkeoloji Parkı which translates to the Castle Macedonia (Clock) Tower and Urban Archaeological Park. The only structure still standing here is one of the initial four towers of the ancient city walls built during the reign of Roman Emperor Hadrianus (117-138 AD). The tower is located near the Üç Şerefeli Camii. After conquering the Thracian tribes in this area, the emperor renamed this city Hadrianopolis. The Makedonya (Saat) Kulesi in Edirne, Turkey. Remains of an ancient pottery oven. The area surrounding the tower includes some ancient ruins that have been excavated in recent years, but sadly are not being maintained very well. However, the area is still worth a visit! 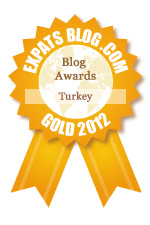 Edirne is just a short car or bus-ride away from Istanbul, making it an easy weekend get-away. If you do not have a car, the easiest way to reach to Edirne is by intercity bus from Istanbul. Several bus companies, such as Metro Turizm and Ulusoy, run buses from Istanbul’s Esenler Otogar everyday to Edirne. The trip takes about 2 hours and 40 minutes. Here is a list of more Turkish bus companies.